Looking for some new Thanksgiving books to read this year as a family? We've gathered up some of our favorites that will surely make your holiday reading extra fun and memorable. Head out with the kids to your local library or your favorite independent bookstores for this year's family holiday read-a-thon picks and most importantly -- have a great Thanksgiving! Our extensive online directory includes dozens of independent bookstores throughout Western Washington with plenty of great holiday picks for all ages. 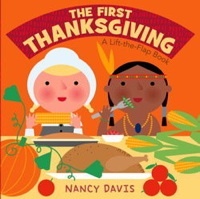 The First Thanksgiving: A Lift-the-Flap Book, by award-winning illustrator Nancy Davis, will be a great introduction for teaching your tot about the importance of Thanksgiving, the holiday's history and the meaning behind why we "give thanks" each year. Recently published in September of 2010, this toddler board book is sure to be a hit this season. And if you love Davis' adorable illustrations as much as we do, consider checking out her Christmas toddler board book, Christmas Shapes (written by Jane E. Gerver), that includes press-out Christmas play pieces! If your child loves The Adventures of Captain Underpants, he will certainly get a kick out of David Pilkey's 'Twas the Night Before Thanksgiving. Written as a parody of Clement Moore's classic Christmas poem 'Twas the Night Before Christmas, this book tells the tale of eight baby turkeys as they are trying to escape Farmer Mack Nuggett with the help of eight children who are visiting the farm on a field trip. Recommended for ages 4-8, this book will surely be a raucous good time for your beginning readers this holiday. "Holy Cow Turkey!" 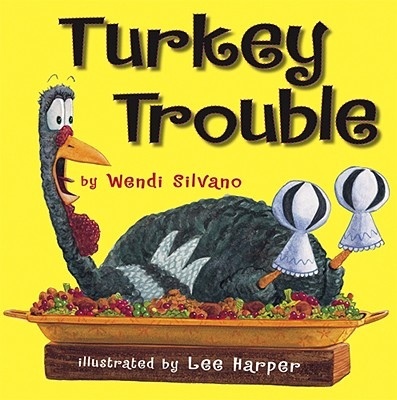 Your child will get a kick out of Wendi Silvano's inventive book Turkey Trouble, as Turkey attempts to disguise himself as the other farm animals to escape Farmer Jake and the possibility of becoming the Thanksgiving dinner centerpiece. Turkey tries to become a sheep, a cow, a pig and a rooster... only until Farmer Jake decides that maybe the rooster will be dinner instead! Recommended for ages 4-8 and illustrated by Lee Harper, Turkey Trouble has a fantastic surprise ending that will leave everyone happy come Thanksgiving dinner -- including Turkey! Everyone's favorite aardvark is back in this Thanksgiving holiday hit! 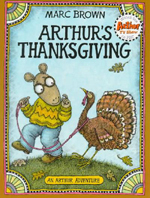 In Arthur's Thanksgiving, Arthur is asked to direct the "Thanksgiving Day" school play, but trouble ensues when none of his classmates will play the main role as the turkey. Arthur begins to think nonstop about turkeys -- while he's doing his homework, the dishes, practicing the piano -- and finally decides to play the turkey himself. But once Arthur comes out on stage in the turkey suit, everyone begins to laugh at him... though he's not alone for long! His family and friends join him in turkey suits and remind readers overall how important family and friends truly are. Recommended for ages 4-8, this book is also available in Spanish! Silly Tilly's memory is playing tricks on her again -- she has "forgotten to remember" that she has invited all of her friends over for Thanksgiving dinner! On top of that, Tilly has accidentally sent out her recipe cards instead of the invitations. Oh no! Fortunately Tilly's friends are one step ahead of her and each come to dinner with a delicious Thanksgiving dish in hand. 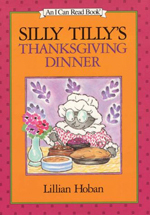 Recommended for ages 4-8, Silly Tilly's Thanksgiving Dinner is a great I Can Read Book for the beginning readers in your family this holiday. Plus, it doesn't get much better than Lillian Hoban's adorably illustrated furry animal friends and fantastic children's writing. 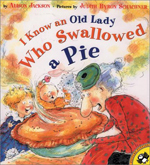 I know an old lady who swallowed... a pie?! Alison Jackson puts a clever new spin on the classic, beloved rhyming song in her Thanksgiving picture book, I Know an Old Lady Who Swallowed a Pie. Illustrated by Judith Byron Schachner, the creator of Willie and May, this madcap book recommended for ages 4-8 will give children a hilarious and fun start on gearing up for this year's family Thanksgiving dinner. Check out this great YouTube video of four-year-old Kenton reading aloud from the book. Absolutely too cute! 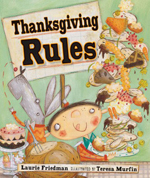 Percy Isaac Gifford has ten simple Thanksgiving rules to offer young readers this holiday season in Laurie Friedman's Thanksgiving Rules. Covering everything from getting dressed, to greeting the guests and helping clean up the house, Thanksgiving Rules includes wacky and fun caricature-style illustrations by Teresa Murfin and is recommended for ages 4-8. As Thanksgiving pro Percy proposes rules such as "the early bird gets the turkey" and "life is sweeter when you eat sweets," young readers will come to realize as Percy does what the true recipe is for the perfect Thanksgiving holiday -- spending time with your family! 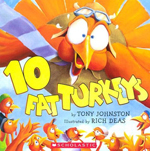 Ten Fat Turkeys, written by Tony Johnston and illustrated by Rich Deas, tells the story of -- you guessed it -- ten very silly, fat turkeys! Recommended for ages 4-8, this cute book counts down the turkeys one by one as they fall off the fence in funny, creative ways. More of an amusing and silly turkey adventure rather than a serious Thanksgiving tale, this book is easy for beginning readers with its "gobble gobble wibble wobble" rhyming goodness and charismatic illustrations. And for the younger readers in your family --Ten Fat Turkeys is also available as a board book! 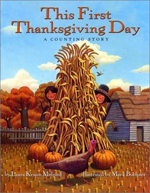 This First Thanksgiving Day: A Counting Story by Laura Krauss Melmed is a great introduction for your little ones to the first Thanksgiving feast shared by the Pilgrims and the Wampanoag Indians in the New World. Illustrated by Mark Buehner, the book includes a well-hidden turkey on each page, along with furry forest animals that your child can count while reading. (There are even a couple of prehistoric creatures blended into the background for finding! )The illustrations are gorgeous, with beautiful autumn New England colors and fantastic depictions of the Wampanoag Indians as they are weaving baskets, hunting and gathering food for the first harvest feast. Overall, a great story for introducing your children to the history of the holiday and the reasons behind why we celebrate Thanksgiving each year. Recommended for ages 4-8. Similar to the popular children's rhyme, One Little, Two Little, Three Little Pilgrims is a great beginner's book on the history of the Thanksgiving holiday and the first harvest feast celebrated between the Pilgrims and the Wampanoag Indians. Illustrated by Lynne Avril Cravath and recommended for readers ages 4-8, the book shows Wampanoag and Pilgrim children working side by side, preparing the Thanksgiving dinner and giving thanks in prayer as a community before their first Thanksgiving meal. Your child can also sing along while reading -- added bonus! 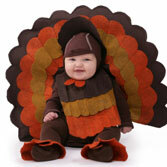 What is your family thankful for this year? Thanksgiving Is for Giving Thanks will definitely make your child consider what he or she might be thankful for this holiday. 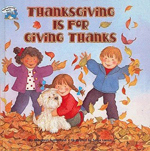 Written by Margaret Sutherland and illustrated by Sonja Lamut, this book plays up the importance of being thankful with its cheerful pictures of family and friends as they give thanks and celebrate Thanksgiving. Recommended for toddlers and preschoolers, this book provides a fantastic introduction on the importance of why we celebrate Thanksgiving each year. The Berenstain Bears are back and this time they are giving thanks by acting out the first Thanksgiving celebrated by the Pilgrims -- with full costumes and props included! 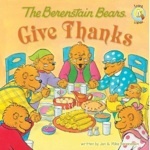 One in a series of beloved children's books, The Berenstain Bears Give Thanks recreates the meaning of Thanksgiving for young readers with all of their beary favorite characters. You may also consider checking out The Berenstain Bears Think of Those in Need or The Berenstain Bears and the Prize Pumpkin for other important Thanksgiving-ish themes this holiday. Thanksgiving Day at Our House: Thanksgiving Poems for the Very Young is composed of fifteen poems, touching on modern holiday activities such as a school holiday play and a Thanksgiving parade while mixing in the history of Thanksgiving with poems about the first Thanksgiving feast and the Mayflower. Written by Nancy White Carlestrom and illustrated by R.W. Alley, the book is recommended for ages 4-8 and includes beautiful illustrations that depict the serious meaning behind Thanksgiving and yet also the silly fun times that can be shared as a family during the holiday. ... If You Sailed on the Mayflower in 1620 provides a great historical introduction to the events leading up to the first Thanksgiving feast shared by the Pilgrims and the Wampanoag Indians in Plymouth Plantation. Written by celebrated children's author Ann McGovern and illustrated by Anna DiVito, this book details why the Pilgrims left England, their journey to America on the Mayflower and the hardships endured in the New World through a lively question-and-answer style. Recommended for ages 9-12, If You Sailed as well features important parts of the Pilgrims' history such as the Mayflower Compact and the peace treaty that was made with the Indians, all while highlighting their day-to-day lives and survival methods. Every holiday has its own familiar traditions and symbols, but where do these customs come from, how did they begin and how do we choose to celebrate them? 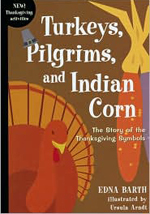 In Turkeys, Pilgrims, and Indian Corn, Edna Barth combines historical research with entertaining and lively prose to relay the importance of Thanksgiving while uncovering fascinating and not-so-well-known holiday symbols, facts, legends and historical details. Beautifully illustrated by Ursula Arndt and recommended for ages 9-12, this book is one that both children and adults can learn from with its exposure of general myths on topics such as clothing, historical moments and relations between the Pilgrims and the Native Americans. If your child is ever planning to study the Pilgrims and the first Thanksgiving, this book is a great pick; it's an enjoyable read, yet mixed with interesting and important historical research.